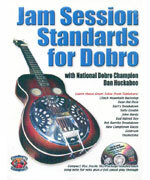 Learn you favorite dobro licks and patterns with these instruction CD instruction packages. The best way to learn is through imitation, and with these instruction CD's, you can hear exactly how the lick is to be played and then you work on it until you are able to repeat it. 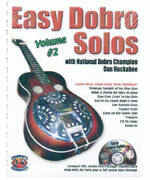 Most of these dobro instructional CD's include dobro tablature booklets. 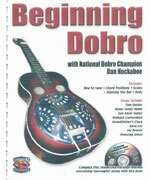 Dobro is a tricky instrument. 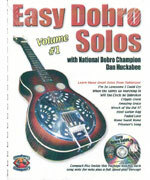 These CD's will help you play the dobro licks the way they were meant to be played. These arrangements are easy to learn & play but they still sound good! Each tune is played once at normal speed & then taught one section at a time on the CD. The sections are all marked off & labeled in the tablature booklet. 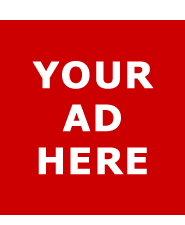 These are good solid arrangements for the intermediate-advanced player. Each tune is played once at FULL SPEED then taught one section at a time on the CD. The sections are all marked off in the tablature booklet, making it easy to follow. Taught exactly as Josh played them on the original recordings! 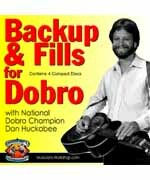 For over 20 years, these have been the materials that Dobro players have cut their teeth on! 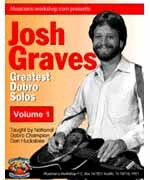 Volume 1: Each tune is played once at normal speed and then taught one section at a time on the CD. Taught exactly as Josh played them on the original recordings! For over 20 years, these have been the materials that Dobro players have cut their teeth on! 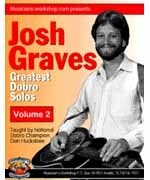 Volume 2: Each tune is played once at normal speed and then taught one section at a time on the CD. Taught exactly as Josh played them on the original recordings! For over 20 years, these have been the materials that Dobro players have cut their teeth on! 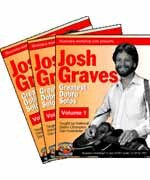 Volume 3: Each tune is played once at normal speed and then taught one section at a time on the CD.